Will There Be Another Deadly Assault on Fallujah? The Iraqi government has declared that Fallujah has fallen entirely into the hands of “Al Qaeda and Daash”. This follows over a month of US and Iraqi PR campaigning in the news media touting Al Qaeda’s ambitions to carve out an emirate in the region. It also comes just days after the revelation that the regime in Baghdad has received hellfire missiles and drones from the United States for the stated purpose of fighting Al Qaeda in the last month. Behind the scenes, however, Shafaq News reports that some government sources admit that the claims are a deliberate deception. One source describes the government stance as: “Deliberate confusion in the information and attempts to create a dangerous atmosphere in the city to be dealt with in a militarily way in every way,” but in reality, “Fallujah and even other cities are still experiencing quieter days than before”. By citing Al Qaeda and linking it to the brutal terrorist mass-murder campaign as well as alleged ambitions to create an entire state, the Iraqi government may be working towards justifying unleashing high levels of military violence on Fallujah, but who really is controlling Fallujah? 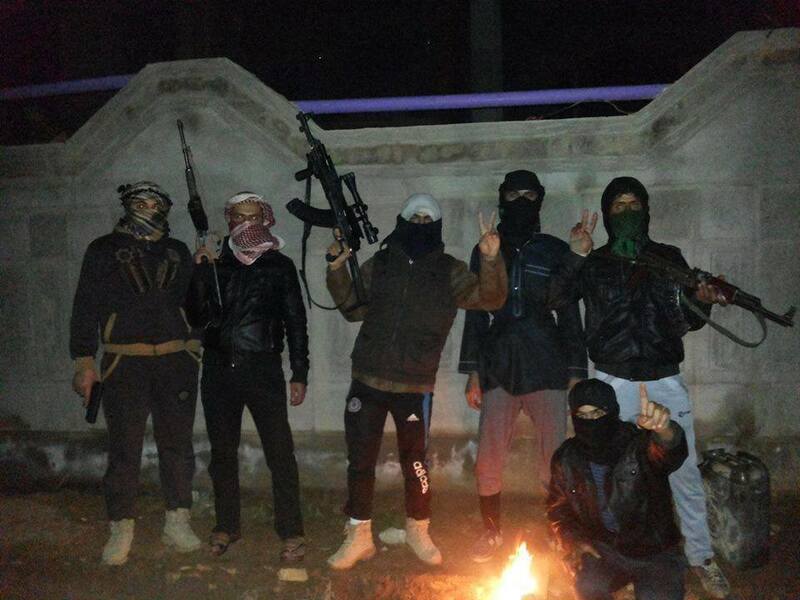 Political revolutionaries affiliated with the protest movement in Iraq have been describing the anti-government forces in places such as Fallujah as “Tribal Rebels”. Many are from the “Awakening” who were originally opponents of the US occupation recruited and armed by the US to fight Al Qaeda. Clearly some in the protest movement are supportive of armed attacks against government forces, and that represents a large section of the Iraqi population. While Western media have been reporting the horrific and seemingly ever-increasing bombing campaign, they have neglected the massive peaceful protest movement that has been in action for a year. As The Common Ills reports, Iraqi reporters face death and serious government repression for reporting on such matters, but the Western media need only the will to write something that might contradict the official Western narrative on Iraq. Now it seems as if armed clashes between regime forces and militias are spreading and intensifying – perhaps enough to foreshadow bottom-up regime change in Iraq, but that too is not deemed newsworthy. Instead there is a deliberate and convenient conflation with the bombing campaign and the aforementioned supposed ambitions of Al Qaeda. One Washington blogger has already taken the opportunity provided by Baghdad’s claims about Fallujah: He rehabilitates George W. Bush and attacks Obama for letting Al Qaeda take over Fallujah again [sic] when Bush had done such a good job of eradicating them earlier. The principle overseas beneficiary of all of Iraq’s violence is the US. Unlike regional powers it is not threatened by the instability that it creates. In fact Middle Eastern instability maintains high oil prices which stabilise US global hegemony. (Admittedly this is at the expense of the “99%” in the US, but US foreign policy has never directed by concern for the US people and it is becoming ever less excusable to claim that it is.) Iraqis are ever more hostile to Iran, which a real rival/enemy of the US. The US officially supports the Maliki government and unofficially supports the Sunni Islamist militias who are part of the anti-government forces. Iran also supports the Maliki government, perhaps feeling they have no choice or perhaps not understanding how much this benefits the US. The repression they sponsor (in cooperation with the US) drives the extremism they fear. Iran would be better served by a democratic, tolerant and pluralistic Iraq (or, for that matter, a democratic tolerant and pluralistic Iran). In Iraq the lines between “real” terrorism and “false flag” terrorism are blurred. Historically agents provocateurs have often blurred those lines, sometimes transforming revolutionaries into terrorists by their presence alone. In this instance we need no details of such infiltration to draw the same sort of conclusions. It is enough to know that the bombing helps maintain the power of the current government in Iraq and that their overseas backers are inevitably linked to the US which also backs their allies in Syria and simultaneously backs the Iraq government. Though it tries to maintain deniability (and apparently uses “a complex, shadowy system of weapons movement, with diverse, sometimes parallel, supply routes”) US involvement is too comprehensive to properly conceal. As with Syria, the US imperial interest is served by conflict and instability and the brutal truth is that US actions are crucial in creating and maintaining these conflicts. Now, as it was in 2004, a whole city is being labelled “terrorist”, but it is first and foremost a city of resistance. In 1920, when it was only a small town, Fallujah was a centre of spreading resistance to British imperial rule and this seems to have been formative. In 2004, in response to the crimes of US personnel (including the murder of unarmed demonstrators) Fallujah rose in resistance to the US-led occupation. Any so-called “Al Qaeda” who entered the city thereafter were drawn by the strength of the resistance there, they were not the cause of the resistance nor were they the target of the US assaults. Now it seems that the current Iraqi government, a client of both the US and Iran, may be preparing to repeat the destruction and suffering wrought on the people of Fallujah in 2004. ← The Numbers Game: New Research Shows that US has Saved Millions of Iraqi Lives. Missing here is an intention to do something about what the reader is being reminded of having happened and happening, not to mention going to go on happening unless something more than writing about the dying. This merciful intention could have been inserted with a single sentence noting that until the initial prosecutable genocidal crimes against humanity are brought before the law and US citizens and financial entities sued for compensation for wrongful death in the millions, injuries in the tens of millions and reparations for massive distraction of property and theft of natural resources, genocidal war will remain a good investment, and the killing and indescribable suffering will continue and continue to be written about. Thanks for that comment. I only wrote that article because there seemed to be nothing else out there making these points. There are now some articles about which question the validity of the Iraqi govt claims, although there are still fatuous “progressives” of the alleged left who stick with the simplistic blowback narrative of an Al Qaeda takeover. My priority was to remind people that the US was entangled on both sides, otherwise we tend towards the narrative highlighting the dangers of the US pulling its troops out. A massive lie, but one that clearly appeals to US pundits on both sides of the fictitious divide in the public discourse. Further to your comments however, Dennis Halliday has very recently called for “Accountability and Justice for Iraq” http://www.brussellstribunal.org/article_view.asp?id=1310#.UsnXx7RWNpM. People will continue fighting for that. Personally I believe is a robust interstate judicial mechanism is needed, such as the International Court of Justice but with actual teeth. The ICJ has ruled against the US (in the Nicaragua case) and if it had actually been enforce it might have prevented subsequent aggression. No judicial approach that does not account for and counter hegemonic state power can succeed. In contrast all international criminal proceedings are grossly tainted by selectivity and subservience to realpolitik. The ICTY, ICTR, ICC and even Nuremburg Tribunal were and are effectively expressions of victor’s justice and regardless of the merits of individual rulings, they are collectively a cancerous abomination. It is clear that lives are not saved by this selective approach. Instead the incentive is for enemies of the West to fight to the death rather than accept peace in return for immunity because that immunity will not be respected. We need an ICJ type of ruling that will rule against the United States itself. We need a UN which will back that up (the UN being the United Nations – i.e. the “member states” not the bureaucratic organisation based in New York). If handled correctly this will give incentive to the people of the US to deal with their war criminals and criminal corporations themselves, or maybe extradite some of their leaders. Personally I don’t feel any great need to call for criminal accountability in general terms anyway. It appeals to a more egoistic side of human nature wanting vengeance and the illusion of reciprocity. Imprisoning or executing individuals can only ever be a very hollow and pathetic pretence of justice in the face of such massive crimes involving so many perpetrators of varying culpability. I am less concerned that the criminals are free than I am that they are being lionised and paid as commentators on TV, or giving expensive lectures to rich scumbags. That is the really sickening part. The enemies of humanity are not just the Blairs, Bushes, Cheneys, etc., they are the sycophantic power worshipers who treat them as being better than normal human beings. I wouldn’t let one of those mass murderers into my house, and many others feel the same, but somehow that is banned from the public discourse (in the same manner that they tried to suppress the fact of the widespread hatred of Thatcher in Britain). I hope that explains why I do not call for criminal prosecutions. The imperialists have already shown that they will sacrifice underlings to the ICC. It would be quite a setback to them if they were forced to sacrifice a Western leader in a similar way, but ultimately they would turn that to their own advantage in much the same way that they turn trials of low-ranking military personnel to their advantage. We must stop playing into their hands.